Burning Man. It’s a party, a music festival, an art exhibit, a therapeutic retreat, an endurance test, and an experimental, decommodified community with a population in the tens of thousands. It grows out of the barren wasteland of the Nevada desert at the end of every summer, and then it all blows away again, without a trace, after just one week. It is there, in Black Rock City, that I discover my limits and push myself past them, emerging dusty, exhausted, and full of Great Purpose. The playa cracks you open. No matter how hard your shell, no matter how strong your grip, you cannot hold for one week in the face of the harsh conditions of the alkaline desert. Whatever bits of yourself you’ve been hiding, be they silly or sultry or angry or tricksome, they will spill out. Your greatest fears, your most ecstatic self, your truest everything will, by the end of the week, be strewn from one end of the playa to the other. Burning Man opens the floodgates and allows the id to roam freely. Imagine: 68,000 ids roaming the desert, clashing and jiving and dancing ’til dawn. It’s a hot mess, but one I’m drawn to time and time again because I know that something revelatory will happen to me, but never knowing what, exactly, that revelation will be. I’ve just returned from my most recent trip Home to Black Rock City, and I must say that I am still in a bit of shock over what the playa revealed to me this year. Sometime around Wednesday, in the midst of my burn, I realized that I probably would not be returning. This is the first time I have come back to Portland without being filled with wild creative purpose for next year’s burn. I’ve never felt like this before, but if I had to compare it to a similar experience I’d say it feels a little like breaking up with someone; even though I know I’m ready to move on, I’m sad because I’ve invested a lot of time into making countless good memories, and there’s part of me that wishes I could just go on the way I have been because it’s become so familiar. My revelation after my first burn was that I needed to get more in sync with my true self. I knew I was out of sync because that week I’d spent in Black Rock City was the happiest I’d been since I was a small child. Community. Participation. Creativity. Immediacy. Connection. When I thought of returning, my heart absolutely ached. 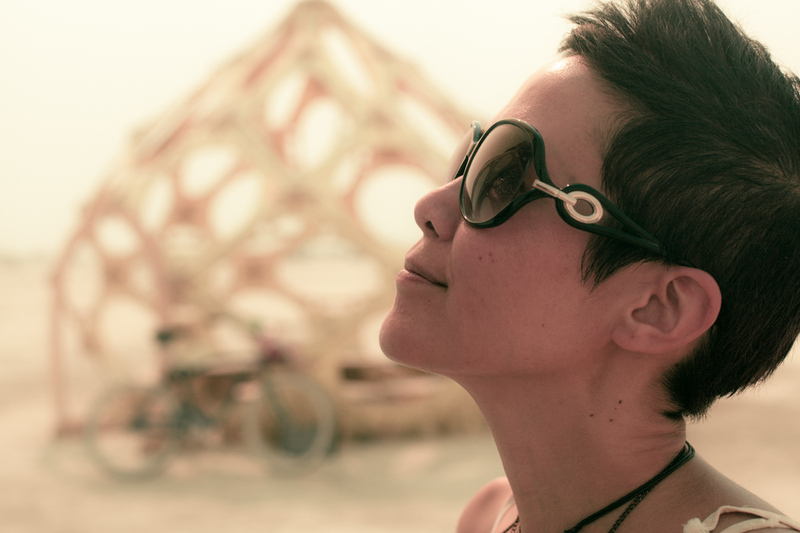 I needed more of that joy in my everyday life; I needed to take what I loved most from Burning Man and apply it to the other 51 weeks of the year. My husband felt the same way, so we immediately began making adjustments. Since 2008 we have slowly but steadily worked at learning to honor our true selves, constantly questioning our motivations for doing things so that we are now consistently making decisions that best suit us and our desires. 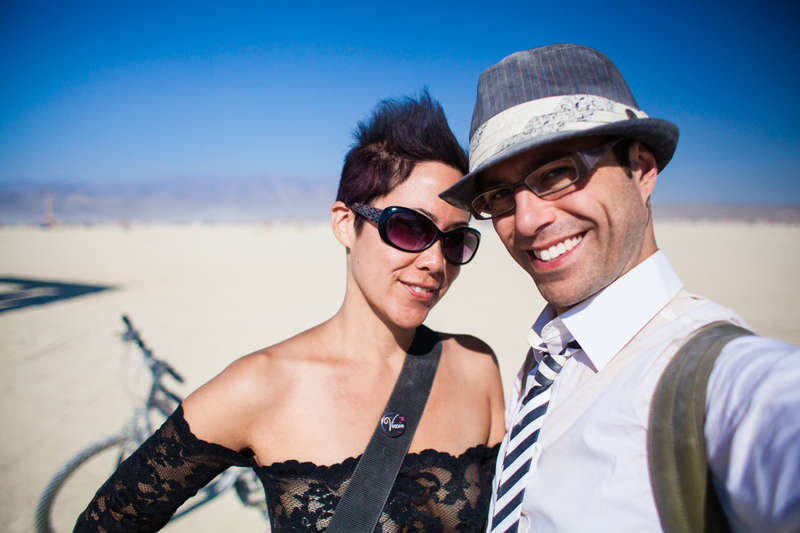 It’s been a long road, especially because both of us are “givers” and have a hard time distinguishing our own needs from other’s, but at this point I think we’ve done a good job of manifesting those things we love best about Burning Man in our everyday lives. We always have loads of creative projects in the works. We strive for truthful interactions with each other and everyone else at all times. We cherish our ever-expanding group of amazingly talented friends. We work to connect with and give to our community. And we do our best to make each other smile. I ultimately feel that previous years at BM have absolutely changed my life in really positive ways, and now the gap between my regular life and what I experience at BM is smaller. Perhaps the default world’s slippage in to BM is balanced by the amount BM has affected our regular lives, which means BM isn’t such an extremely amazing experience anymore. BM is becoming more like the regular world, and the regular world is becoming more like BM? It’s hard for me to accept that I am completely done with Burning Man, yet that is how I feel right now. It’s a melancholic time for me, full of wistful remembrances of dusty hugs, afternoons spent drinking tasty concoctions served to me by beautiful beaming strangers, rides on fanciful slowly rocking vehicles, unreserved silliness and deep belly laughs, and more than my fair share of serendipity. 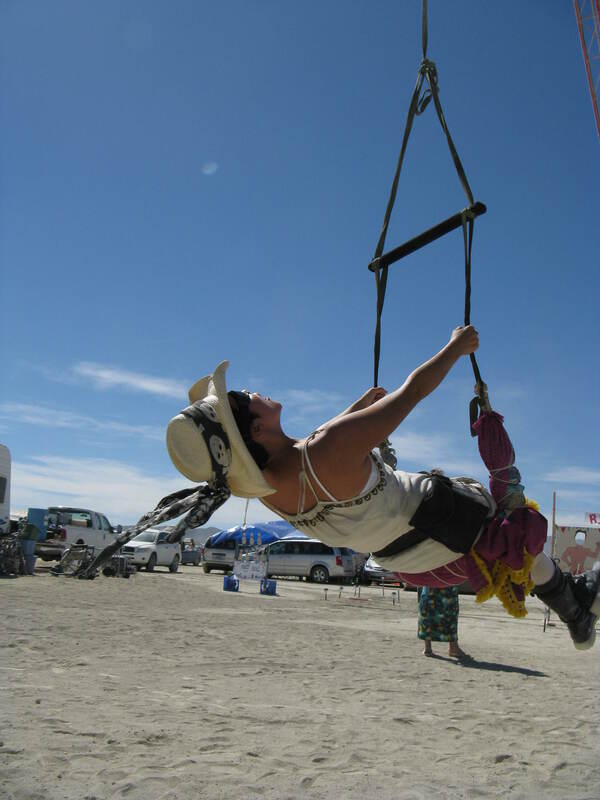 This entry was posted in Burning Man, Pilgrimage. Bookmark the permalink.